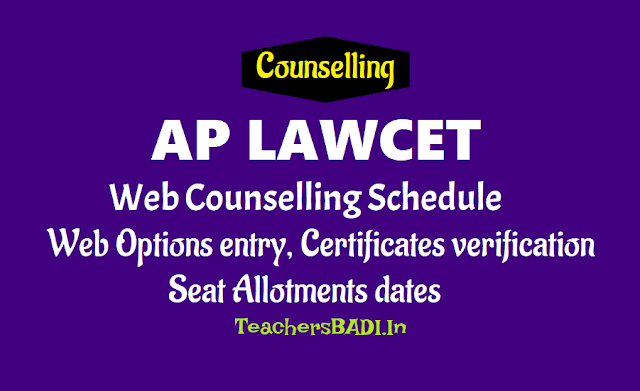 AP LAWCET 2019 Web Options entry, Certificates verification, Seat Allotments dates, AP LAWCET Seat Allotments 2019, APLAWCET 2019 Provisional Allotment List : AP LAWCET 2019 Web Counseling: APLAWCET 2019 for admissions into LL.B & LL.M courses. The Andhra Pradesh State Council of Higher Education is conducting admission to the Candidates into Under graduate programme in Teacher Education who possess Undergraduate Degree in Arts/Science/Commerce/Technical courses and qualified in State level entrance test AP LAECET conducted by APSCHE. To provide qualified teachers to education in schools/colleges and to encourage postgraduate and research programmes in education these admissions are encouraged. Candidates after acquiring degree in teacher education have opportunity to join in various institutions and can also acquire higher qualifications by joining research organizations in education. AP LAWCET and PGLCET Final Phase Admissions Counselling Notification released for Certificate Verification and Web options for Web Based Counselling. Eligible and qualified candidates of APLAWCET & PGLAWCET-2019 are informed to exercise the options using their old password and Login ID.No. (already whose certificates are got ferified) for the leftover seats and seats now available and consequential vacancies that may arise in process of allotment from any Help Line Centre or Internet facility (Cafe/Home) as per the schedule given below. The Candidates who have not paid processing fee earlier and not attended for Certificate verification during first phase shall pay the processing fee from ...10.2019 through payment gateway in https://aplawcet.nic.in and get their certificates verified on ...10.2019 and ...10208 and exercise options till ...10.2019 upto 5.00 PM as per the Ranks mentioned below. All Help Line Centres will work from 09.00 AM to 05.00 PM. Help Line centers are AU, ANU, SVUC and SKU only. • Candidates who have secured seats but not shown to joined in the allotted college. • Who have not secured seats so far, but got their certificates verified. • Who have not exercised the options so far, but got their certificates verified. • Who have secured seats, reported at allotted college and aspiring for a better option. 2. Candidates who are satisfied with their previous allotment and reported at college need not exercise option once again. 3. Candidates shall note that if they exercise options now and a seat is allotted as per the options, the vacated seat will be allotted to next meritorious candidate and hence they will have no claim on the previous allotment. Allotments will be placed on the website on ....10.2019 after 6.00 PM. Candidates shall invariably report at allotted college on or before ...10.2019. Classes will commence from ..-10-2019 as already informed. 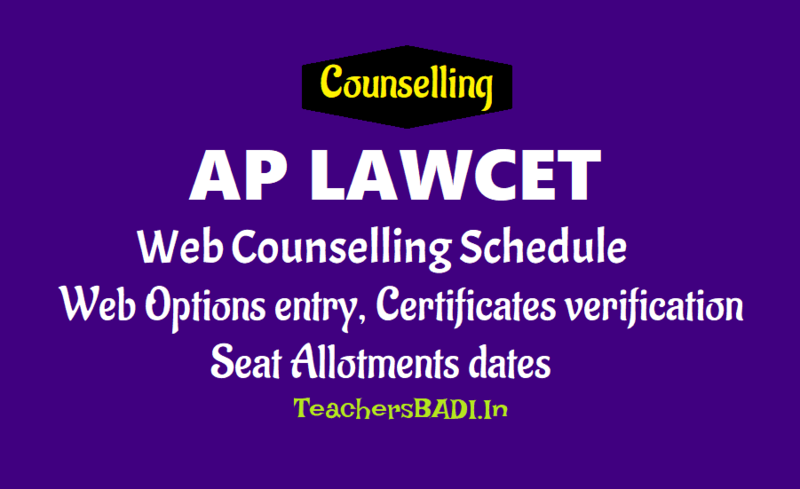 Web counselling process: The process of inviting the qualified candidates of AP LAWCET and allotting a seat as per their option is known as Counseling. In the Web Counseling candidates can select a college from Internet facility available at home or internet café after getting his/her certificates verified at any one of Helpline Centres. The Andhra Pradesh State Council of Higher Education will issue a notification in news papers and place the details of counseling indicating the dates and ranks of the candidates to be attended for Registration, Verification of Certificates and Schedule for Exercising options and also notify the list of Help-line Centres in the designated website. Candidates who fail to report for Certificates verification will not be considered for allotment of seats in any of the colleges. date of issue] (in case the candidate - desires to claim fee exemption). After Certificate Verification in Help-line Centres, login ID will be sent to register mobile of the candidate. Using the credentials like registration number, hall ticket number, date of birth, candidates have to create a password by himself / herself. Using this password and other credentials mentioned above, candidate can login into the website for option entry. An OTP will be sent to the registered mobile after successful login. Using the OTP candidate can enter the preferential choice number (option) against each college and course he/she wishes to join in case allotted. Candidates are advised to make a manual exercise on paper to prepare a list of options , prioritize them in consultation with their parents and friends and then enter the options on the web. Candidates can exercise any number of options and can take print out of the saved options. The detailed User manual for registration, login, exercising Options is also placed in the web.